Continuing our base layer extravaganza, you can finish off your stunning winter ensemble with these great liner socks. Going against the grain of the sky-high prices charged by designer sock vendors these days, these are available for a mere $9/pair. They wick well and have a "natural anti-microbial silver coating" that doesn't wash out. Keeps your nasty dogs from barking, it does. 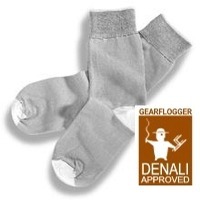 They're tough too, showing no appreciable wear after two weeks constant use on Denali. They are not quite as elastic as most liner socks, but that didn't affect their comfort.